Summary: Morocco’s friends in the West, especially the United States and France, must pressure Rabat to expedite a significant devolution of power to the Western Sahara to limit the threat of instability. The Western Sahara, a former Spanish territory annexed by Morocco despite Algerian objections, is a critical region that could quickly become part of the criminal and terrorist networks threatening North Africa and the Sahel. The undergoverned areas abutting the territory are becoming major hubs for drug trafficking, contraband smuggling, and weapons circulation. And Al-Qaeda in the Islamic Maghreb (AQIM) is extending its reach in the region. The potential for destabilization is real. AQIM and its offshoots in the Sahel are already working to expand their partnership with smugglers from massive refugee camps in Tindouf, Algeria, and to enlist recruits among the disenchanted youth there. If AQIM strengthened its alliance of convenience with the Polisario, the movement that has long fought for Western Sahara’s independence, a formidable terrorist organization could emerge. Nearby Moroccan-controlled Western Sahara is plagued by widespread socioeconomic protests and ethnic strife. A deep enmity has developed between various groups in the territory, some of which have ethnic and cultural ties to inhabitants of the Tindouf camps. A growing number of Western Saharans find themselves increasingly isolated and frustrated—a precarious development. Just over a year ago, Laayoune, Western Sahara’s biggest city, was the site of violent rioting. Ethnic cleavages and cultural animosity have become dangerously pronounced, threatening to further fuel radicalism, violence, and confrontations. Meanwhile, the parties to the conflict are not getting any closer to reaching a mutually satisfactory settlement. Morocco maintains its sovereignty over the territory. The Polisario continues to fight for independence, and its staunch supporter, Algeria, is quite satisfied with the status quo. Both Morocco and Algeria could help the region avert a slide into chaos—if only they could see past the hostility and distrust that have long separated them. Morocco’s proposal for autonomy for the Western Sahara and the country’s July 2011 constitution are the first steps toward a solution. Rabat’s friends in the West, especially the United States and France, must pressure Morocco to expedite a significant devolution of power to the Western Sahara to limit the threat of instability. In discussions of organized criminal activity in the Sahel and the growing reach of Al-Qaeda in the Islamic Maghreb (AQIM), most regional and Western defense strategists agree that urgent efforts are needed to address the frozen conflict in the Western Sahara because it encourages the emergence of violent entrepreneurs, drug warlords, and other nefarious elements. A Spanish colony since 1884, the Western Sahara did not become independent when Spain withdrew. Instead, Spain ceded the territory to Morocco and Mauritania in 1975, with Mauritania relinquishing its acquisition in 1979. Not all inhabitants of the territory accepted the deal, however. The Popular Front for the Liberation of Saguia al-Hamra and Rio de Oro (Polisario), formed in 1973, established a government-in-exile in 1976. The Polisario claims that under international law, as a former colony, the Western Sahara should have been granted independence. Based in and backed by Algeria, which is motivated both by principle and its rivalry with Morocco, the Polisario led a guerrilla war against Moroccan forces until a 1991 cease-fire. The fighting has caused the displacement of thousands of people—most of whom fled to refugee camps located around Tindouf in southwest Algeria—and the killing of thousands of fighters. The territory was divided into a heavily fortified Moroccan zone, constituting 85 percent of the territory and protected by defensive walls (called “berms”) built in the mid-1980s and manned by 150,000 soldiers. The Polisario controls the remainder of the area, deemed by Morocco as a buffer zone and of no strategic or economic value. The undergoverned areas abutting the Western Sahara are becoming major hubs for drug trafficking, the smuggling of contraband, and the circulation of weapons. Besides inflicting these terrible human and economic costs, the conflict has also negatively impacted trans-Saharan security. The undergoverned areas abutting the Western Sahara, especially northern Mauritania and the Polisario-administered camps in southwest Algeria, are becoming major hubs for drug trafficking, the smuggling of contraband, and the circulation of weapons. There is growing evidence to suggest dangerous connections between criminal organizations, AQIM, and the Sahrawi refugees in Tindouf. Such links are bound to deepen should the social and political conditions in the camps deteriorate further or if civil unrest plagues the Moroccan-controlled Western Sahara. Furthermore, young Sahrawis in the camps are becoming increasingly disenchanted by the failure of the nationalist agenda and upset by the perceived corruption and clientelism of the Polisario elites. The prospect that the Western Sahara will become even more integrated into the criminal and terrorist networks threatening North Africa and the Sahel is troubling to the United States and its European allies. Already, the Western Sahara conflict has undermined regional security cooperation and assistance. The hostility and distrust between Morocco and Algeria have been so destructive that the whole region has been dragged into a vicious circle of collective suspicion, counterproductive rivalries, and self-defeating policies. The prospect that the Western Sahara will become even more integrated into the criminal and terrorist networks threatening North Africa and the Sahel is troubling to the United States and its European allies. 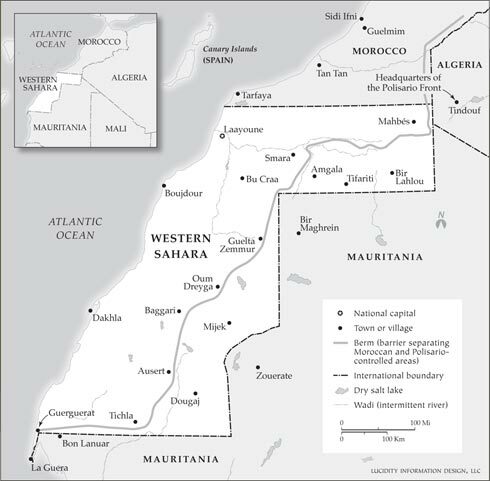 Resolving the Western Sahara conflict would help untangle the main existing deadlocks in North Africa and the Sahel: impediments toward regional reconciliation and coordination in the fight against violent extremism and organized criminal activity. Based on the author’s multiple trips to the Moroccan Western Sahara and dozens of interviews, this paper examines the security risks of the persistence of the conflict by analyzing the destabilizing forces that heighten local tensions and regional instability. In the Moroccan-controlled Western Sahara, a semblance of stability and calm has returned since the deadly violence that rocked its biggest city, Laayoune, in November 2010. Despite intermittent protests and sporadic ethnic and tribal skirmishes, the major population centers have resisted the ongoing tide of insurrection and demonstrations that has altered the status quo in North Africa. The near absence of political agitation is quite notable given the underlying drivers of discontent and simmering ethnic frictions. The region’s inhabitants sat out pro-democracy protests by the February 20 Youth Movement that launched demonstrations elsewhere in Morocco. They also turned out in force to endorse the July 2011 constitution and vote peacefully in the November parliamentary elections. The Islamist Justice and Development Party, which won the plurality of votes in the November 2011 parliamentary elections, managed to make inroads into the Sahara by successfully tapping into its reputation of probity and growing understanding of the intricacies of local power politics. Given its ethnic and tribal configurations and notoriously patronage-ridden politics, the Islamists had never before managed to win a single seat in the Sahara. Senior Moroccan officials enthusiastically point out how the region has withstood the “three evil forces” of separatist uprisings, widespread socioeconomic protests, and ethnic strife. The Polisario, the proclaimed defender of Sahrawis’ rights to self-determination, failed to whip up ethno-separatist sentiments and drive political revolt against Moroccan rule, and its calls for the boycott of recently held elections also largely fell on deaf ears. The Sahrawis, an ethnic group that shares the same language and social customs, populate an area that encompasses swathes of northern Mauritania, western Algeria, southern Morocco, and the disputed Western Sahara. In the latter, one can find native Western Saharans as well as Sahrawis from the adjacent southern Moroccan provinces. During my most recent trip to the region, locally elected representatives, tribal leaders, and senior political and security officials gleefully reminded me—just in case I failed to take notice—of the juxtaposed realities on the ground in the Moroccan-administered Western Sahara and in the Polisario-controlled Tindouf camps. The former remains relatively stable and secure while the latter is increasingly becoming infested with militancy, illegality, and drug smuggling. The most recent example of this state of affairs in the camps took place in October 2011. Three aid workers—an Italian and two Spaniards—were kidnapped from within the camps administered by the Polisario. That seems to confirm the long-held Moroccan belief that the deteriorating social and political conditions in the camps of Tindouf represent a tinderbox waiting to explode. Populated by thousands of idle and frustrated fighters and networks of seasoned traffickers, the [PQ: Tindouf] camps are naturally an appealing target for AQIM’s military and smuggling wings. The slide of growing numbers of disenchanted Sahrawis toward banditry and militancy should therefore come as no surprise to the international community, though such a development carries enormous risks to the stability of North Africa and the Sahel. The deteriorating social and political conditions in the camps of Tindouf represent a tinderbox waiting to explode. Populated by thousands of idle and frustrated fighters and networks of seasoned traffickers, the Tindouf camps are naturally an appealing target for AQIM’s military and smuggling wings. AQIM and its offshoots in the Sahel work relentlessly to expand their partnership with smugglers from the camps and enlist recruits among disenchanted Sahrawis. The terrorist group has already made small inroads into the Arab and Tuareg tribes in Niger, Mali, and Mauritania. If it can expand its alliances of convenience with the Polisario tribesmen of the Tindouf camps, the militant movement can become a formidable terrorist organization. The involvement of Sahrawi youths in narcotrafficking is also becoming a disturbing reality. Sahrawis are increasingly socially isolated, lack direction, and have no prospects in sight. They feel abandoned by their aging and out of touch leadership, and turning to criminal networks becomes a way of turning against a regime that has failed them and an international community that pays lip service to their sufferings. It is in this context of increasing criminal activity and social tensions in the camps that AQIM’s presence becomes threatening. The involvement of Sahrawi youths in narcotrafficking is becoming a disturbing reality. The partnerships between AQIM and elements of the Polisario may not be based on ideological affinity and are not as widespread as is feared, but they do exist and constitute a major security threat to the Maghreb and the Sahel. The fear has always been that the frustration that leads to criminality might also lead to militancy and criminal terrorism. “Powerful terrorist organizations like AQIM are expert at detecting persons showing signs of vulnerability,” said Michael Braun, a former director of operations of the Drug Enforcement Agency. “Thus, the camps of Tindouf represent a potential gold mine for recruiters from groups like AQIM.”2 With the significant amount of loose Libyan weapons and the proliferation of skilled and angry fighters, the potential for destabilization is real. The destabilizing consequences of the potential spread of organized crime and militancy in the camps of Tindouf is of great concern to the countries of the region, including Mali, which shares a border with Algeria and Mauritania. The last two years have seen a number of skirmishes between rival Malian and Sahrawi drug traffickers. Regularly, Sahrawi or Malian assailants take members of their respective communities hostage to guarantee that drug shipments will be delivered. This has led to some “dramatic reprisals” with civilians as collateral damage. As drug money increases, there will likely be more battles over trafficking routes and turf, with serious consequences for the state and society. The regular vendors, traders, and peddlers have the impression that they can no longer eke out a living or that what they bring in pales in comparison to the earnings from smuggling and drugs. Algeria, the main patron of the Polisario, must also be concerned about this looming threat emerging from the camps within its territory. For years now, Polisario leaders and their Algerian backers have categorically denied that the Sahrawis, placed under their tight control, engage in any mercenary or militant activity. The Sahrawis are not, according to the Polisario and its supporters, part of the booming trans-Saharan drug-trafficking networks and kidnapping cells. Sahrawi criminal networks have expanded their operations and influence, undermining social structures and the checks on illegal behavior that the traditional tribal lifestyle used to provide. The evidence, however, runs counter to this official line. Indeed, a study conducted by Altadis (a European tobacco company) revealed that “Sahrawis are involved in a vast network of smuggling . . . using various routes, passing through the Western Sahara to Algeria via Tifariti and Bir Lahlou, oases controlled by the Polisario Front.”5 As proceeds increase, these Sahrawi criminal networks have expanded their operations and influence, undermining social structures and the checks on illegal behavior that the traditional tribal lifestyle used to provide. Sahrawi smuggling networks have also used their influence in northern Mauritania, especially in the regions of Adrar and Tiris Zemmour, which border the Western Sahara, to expand their illegal trafficking and make the country a major hub of cigarette, drugs, arms, fuel, and human trafficking. To be sure, this illegal activity has existed for decades. It has been fueled by the conflict over the Western Sahara and has benefited from the ethnic kinship that relates the Sahrawis of northern Mauritania and those of the camps of Tindouf as well as from the complicity of the Algerian army, the Polisario, and senior Mauritanian officials. The problem today, however, is that these illicit activities occur in the context of the expansion of AQIM, growing interdependence of organized criminal networks and state officials, and rising social and ethnic conflict. The combination of these developments can be dangerously destabilizing not only for the fragile states of Mauritania and Mali, but also for the stronger ones, namely Algeria and Morocco. In Morocco, political officials like to emphasize how their heavy military presence in the Western Sahara has kept stability in the area. Indeed, this is probably one of the last areas of the Saharan desert that Western tourists can visit without fear of being kidnapped. But despite the well-guarded border, the area is not impervious to smuggling activities and small-arms trafficking. On January 5, 2011, Moroccan security forces dismantled a twenty-seven-member AQIM cell around Amgala in the Western Sahara, discovering a cache of weapons.6 This arsenal was smuggled through the Western Sahara’s defensive wall. More unsettling was the subsequent arrest of five Moroccan soldiers accused of taking kickbacks from arms traffickers. The arrests demonstrate once again the links between AQIM and transnational smugglers of drugs and arms as well as the difficulty of monitoring the porous borders. The Moroccan-controlled Western Sahara is also vulnerable to societal tensions and ethnic frictions that seriously threaten to destabilize the whole region. Despite the calm that reigns in the area, the challenges to stability and peace remain unchanged. The fact is that the underlying causes that set Laayoune on fire fifteen months ago still persist. Without immediate adjustments in policy, tensions are bound to escalate and mushroom into dangerous ethnic and tribal divides, worsening cultural prejudices and deepening a growing clash of identities. Without immediate adjustments in policy, tensions are bound to escalate and mushroom into dangerous ethnic and tribal divides, worsening cultural prejudices and deepening a growing clash of identities. Should ethnic tensions or social conflict escalate, the Moroccan Western Sahara could easily become caught in the turmoil that afflicts other parts of the Sahel. The threat is not so much terrorism as it is the combination of rising ethnic animosity and expanding transnational criminal networks. That animosity and the rise of criminal networks are deeply embedded in local ethnic conflict, which can seriously destabilize the Western Sahara, weakening social hierarchies, and further exacerbating conflict within groups and the broader communities. Unrest in Hitherto Unexpected Places? Twice in 2011, Dakhla, a small city situated at the heart of the Western Sahara long known for its ethnic harmony and calm, was rocked by ethnic unrest and violent rampages. In each instance, the immediate trigger was a trivial dispute among rowdy young men that quickly degenerated into all-out intercommunal violence. Behind the violence and underneath the rage is a mixture of ethnic animosity and resentments tied to long-standing socioeconomic grievances that continue to fuel radicalism and unrest. Despite Moroccan authorities’ claims to the contrary, this ethnic tension and enmity, tinged at times with racism, is real and was readily spilled out during the dozens of interviews I held with different communities in Dakhla and Laayoune. Some indigenous Western Saharans, now a minority of the population, speak contemptuously of migrant “interlopers” and opportunists from the north who reap the benefits of the region’s resources at their expense. In Dakhla, the indigenous population dubbed a whole neighborhood “Al Wakkala” (the eaters). That neighborhood is a residential area populated by tens of thousands of Sahrawis who lived outside the disputed territory before being transplanted into the Western Sahara in 1991 to vote in a referendum on self-determination for the territory that never took place. The state provided them with housing and still supplies them with food subsidies. The perception that government largesse disproportionately benefits nonindigenous Western Saharans has sowed the seeds of anger and hatred within this community. The bloody events that shook Dakhla in 2011 pitted the indigenous Sahrawi population against the inhabitants of “Al Wakkala” camps. Relations between indigenous Western Saharans and Moroccans from the north are also tense. The latter are referred to as Dakhilis, a generic term that means people from the center of Morocco and designates anyone who is a non-Sahrawi. That includes military personnel and their families, civil servants, workers (carpenters, mechanics), shopkeepers, and traders. There is deep mistrust between the two communities. In the eyes of the indigenous population, Dakhilis are chauvinistic carpetbaggers who steal jobs. They are referred to in demeaning terms as “Ch’lihat” (little Berbers). Those Dakhilis who occupy menial jobs—work Sahrawis view as beneath them—are degradingly called “hammal” (porter). Dakhilis have their own denigrating designations for Sahrawis, who are usually referred to as lazy, untrustworthy, and ungrateful in spite of government preferential treatment. This ethnic disharmony and these mutual feelings of antagonism were laid bare in the November 2010 conflict in the streets of Laayoune. Insurgent Sahrawis deliberately burned properties owned by northerners; the latter responded in brutal kind. The violence and killings of that day put an end to any semblance of harmonious cohabitation between native Sahrawis and Dakhilis. The Western Sahara remains a territory where ethnic cleavages, tribal tensions, and socioeconomic grievances intertwine inextricably. Despite the Moroccan state’s efforts to promote peaceful coexistence, the Western Sahara remains a territory where ethnic cleavages, tribal tensions, and socioeconomic grievances intertwine inextricably. Such fissures have deepened in recent years, creating new divisive forces that threaten the stability of the region. While ethnic nationalism was never a force to reckon with in the Moroccan-controlled Western Sahara, ethnic identity is becoming more pronounced. This does not translate into support for separatism, but it does enhance the forces of divisiveness, which erode the rule of law and undermine the existing social fabric. The growing unrest in the Moroccan Western Sahara is the consequence of the far-reaching demographic and social changes the area has experienced since its annexation by Morocco in 1975. The area experienced four successive waves of migration, each introducing the cleavages that still affect the present state of the region. The first phase began immediately after Spain turned over control of the Western Sahara to Morocco and Mauritania in 1975. The Polisario’s propaganda portrayed Moroccan troops as monsters intent on killing and subjugating Sahrawis. Several native Sahrawi tribes, by some estimates nearly half the population, heeded the Polisario’s call to flee the territory toward the camps of Tindouf in Algeria. To govern the territory, the state had to rely on the remaining local elites and imported other Sahrawis from outside the contested zone, especially from the neighboring region of Oued Noun, north of the Western Sahara. The Moroccan southern Saharan cities of Tan Tan and Guelmim supplied many of the current elites that hold sway in the Western Sahara. Though this policy was necessary to develop a vast territory that the Spaniards left extremely underdeveloped, it began to alter the societal balance of the region and foment the perception that the indigenous Sahrawis were deliberately deprived of positions of authority. In interviews with the original inhabitants of the region, the Sahrawi “transplants” are accused of deliberately marginalizing the indigenous population while enacting policies that favored their ethnic kin. During the first phase of development, hundreds of political appointees, civil servants, skilled workers, and teachers from Morocco were dispatched to assist in governance and to staff lower, intermediate, and senior professional positions in the local administration (justice, health, interior) and schools. These professionals are often described by local Sahrawis as disconnected from local realities and unable to adjust to the local culture and its tribal specificities. The mid-1980s saw a different wave of migrants enticed by the economic opportunities suddenly made available by the state’s aggressive policy of developing the Sahara. The government provided generous subsidies, tax exemptions, and higher salaries than in other regions of Morocco. This period also coincided with severe droughts in the kingdom and serious spikes of unemployment. It didn’t take much to convince thousands of skilled and unskilled workers to migrate to the dynamic economic centers of the Western Sahara. This stream of migration increased linearly throughout the decade, creating new cleavages that proved difficult to mend. The new communities remained detached from the indigenous Western Saharans despite efforts by the state to encourage social contact and intermarriage. The consolidation of the communities never really materialized. It is important to note that though the migrants from the north of Morocco represent a majority of the population in the major cities of the Western Sahara, they are severely underrepresented in elected institutions. Indeed, until the late 1990s, they were barred from participating in local elections. Today, they are merely discouraged from organizing or leveraging their numerical superiority. Another dramatic change in the size and demographic composition of the population in the Western Sahara came in 1991, when the United Nations brokered a cease-fire between Morocco and Polisario rebels. Both parties agreed to a peace plan that was supposed to lead to a referendum in January 1992 in which Western Saharans would choose between integration with Morocco and independence. It was at that time that the Moroccan government transported tens of thousands of Sahrawis, mainly from the southern towns of Sidi Ifni, Guelmim, and the region of Oued Noun, to the Western Sahara to be registered to vote in the promised referendum, which never came. They were housed in tent camps in Laayoune, Smara, Boujdour, and Dakhla. These improvised shelters, dubbed “Al Wahda” (Union), were designed to be temporary, but as the process of integration dragged and stalled, they became permanent. Worse, they were gradually transformed into squatter settlements, where tents were replaced by dilapidated shantytown homes, posing serious sanitary and security problems. The state removed these settlements and provided most residents with newly built housing in the mid-2000s. But up to this day, the state still supplies Al Wahda inhabitants with food subsidies and pays their electricity bills. This has created significant resentment and important fissures in society. The indigenous Western Saharans and non-Sahrawis still complain bitterly about this spoils system and culture of handouts, which allow some groups to scoop up most of the economic opportunities. And a new category of people had been added to the swelling ranks of the welfare system in the mid-1990s. This new stream of arrivals was greatly prized, as it was made up of Sahrawis who fled the Tindouf camps in Algeria. Moroccan authorities saw vindication of their long-held belief that the misery of the Tindouf camps would ultimately prompt Sahrawis to desert the Polisario and its corrupt rule. Senior members of the Polisario were rewarded handsomely upon their return to the country with high-level government positions. The most recent example is that of the current Moroccan ambassador to Spain, Ould Souilem. One of the founders of the Polisario Front, Souilem defected to Morocco in July 2009, denouncing a movement he had helped lead after growing increasingly disenchanted with the authoritarianism of Polisario leader Mohamed Abdelaziz and his protectors in Algeria. “The Sahrawi Polisario is dead,” he said in an interview with the French weekly Jeune Afrique. “Only the Algerian Polisario remains.”7 Revolutionary romanticism has given way to a militarized organization that has no place for discordant voices, lamented Ould Souilem. Similar discontent was voiced by then police inspector general of the Polisario, Mustapha Salma Ould Sidi Mouloud, who publicly endorsed Morocco’s proposal to grant autonomy to Western Sahara in August 2010. That statement led to his imprisonment and then expulsion from the camps. Instead of helping move people from welfare to work, state policies contributed to the development of an entitlement mentality and a dangerous perception that government resources are endless. It is this frustration with relative deprivation that led many returnees to desert the Polisario in the first place and that is now pushing some to threaten (without ever following through) to go back to Tindouf in protest of the lack of equal opportunities they received upon their return to Morocco. Instead of helping move people from welfare to work, state policies contributed to the development of an entitlement mentality and a dangerous perception that government resources are endless. Worse, these preferential policies did not result in eliciting much goodwill from the beneficiaries of the state’s largesse, as they naturally came to expect more benefits. Former Polisario followers expected more material benefits and greater compensation for their years of displacement. They ended up, however, experiencing the same levels of economic and social hardship that their Moroccan counterparts have endured for several decades. The state’s failure to help integrate them into the social and economic fabric of society is especially dangerous. Most of these returnees have been exposed to the Polisario’s nationalism, which exalts militarism and revolutionary transformation in society. All now denounce the Polisario as a corrupt and authoritarian organization, but their views of Morocco cannot be reshaped easily. Their disenchantment with the traditional spoils system, in which local tribal leaders, notables, influential Sahrawi refugees who deserted the Polisario, and elected officials take most of the economic and political opportunities, can easily degenerate into open revolt against the system. There is a growing fear that the state’s clientelistic practices and economic mismanagement are contributing to a polarization of society and sharpening tension and competition between and within ethnic groups over the distribution of rent. Since 1975, the problem has always been that many of the resources were not efficiently used and that money was often quickly thrown at socioeconomic challenges in order to co-opt indigenous Sahrawis and silence dissent. The state has not tried to deal earnestly with the socioeconomic challenges of the region. Thus Morocco’s significant investments have not moved the local economy into a productive stage nor have they fostered sustainable development practices. Frustration with the state for promoting this patronage system was bound to explode, as it did in September 1999 when Laayoune descended into violence. Indigenous Western Saharans took to the streets to demand social justice (jobs, housing, and so on). The security services in turn violently repressed these demonstrations. In 2005, rioting again erupted in Laayoune, after a peaceful sit-in in front of the local prison was transformed into bloody confrontations with the police. Native Sahrawis wanted to benefit from free housing and monthly allowances too, and street protests became a sure means to get the authorities’ attention. After these occasional but deadly outbursts of violence, the state came to realize the mounting gravity of indigenous discontent. The grievances, as articulated in the protests and the dozens of interviews I had in the region, fall into two broad categories: resource distribution and self-governance. Separatist tendencies have always been negligible and the Polisario’s credibility very low, as leaked U.S. State Department cables from Morocco revealed. “Extensive interviews and independent sources in the territory,” wrote senior American official Robert P. Jackson in a confidential document in 2009, “suggest that the principal goal of most Sahrawis is more self-government than self-determination.” Nevertheless, Sahrawis’ frustration and disappointment with state policies in the Sahara are creating sympathies for the separatist cause. The young are especially susceptible to separatists’ appeal and promises of a better and equitable distribution of resources and recognition of their worth and dignity. To address the main drivers of discontent, the government first committed to tackling the housing shortage triggered by steady population growth and the continuing flow of new arrivals. The number of inhabitants went from 74,000 people, according to the Spanish census of 1974, to 507,160 today. In 2008, the authorities designated 18,000 plots of land for distribution to the indigenous Sahrawis. Instead, the land—after the municipal elections of 2009—was allocated based on tribal and electoral calculations. Senior elected officials grabbed public land and handed property deals to their allies and powerful constituencies. The frustration engendered by this gaming of the state’s policy to provide free housing for low-income Sahrawi families quickly turned into anger at the system. In September 2010, thousands of angry Sahrawis began setting up tents outside the city in the now-infamous camp of Agdim Izik on the outskirts of Laayoune to demand jobs and housing. For three weeks, tensions mounted and protesters’ demands hardened, as initial calls for jobs, free housing, and anticorruption measures made way for calls for the immediate resolution of all their socioeconomic grievances. In a predictable sequence, separatist forces and notorious traffickers quickly infiltrated the protesters’ ranks, helping set up popular committees to administer the camp. Once legitimate social demands became contaminated by politicized and criminal elements, the security services decided to dismantle the camp on November 8, 2010. The whole city would then be set ablaze. The government’s preferential policies have exacerbated existing ethnic divides while its noncontingent welfare handouts have promoted a culture of entitlement that is difficult to sustain. Video footage of the riots showed gruesome images of hysterical crowds lynching unarmed security officers. Such frightening carnage, prevalent at the height of the civil war in neighboring Algeria in the 1990s and a trademark of AQIM, has always been alien to the Western Sahara. Laayoune had seen violence and rioting before, but never had the city witnessed such militancy. The sight of masked insurgents marching in the streets of Laayoune—armed with knives, Molotov cocktails, and stones, setting fires to public buildings, schools, and private property—sent a chilling reminder of the region’s vulnerability to destabilization. The violence also demonstrated the deep enmity that has developed between indigenous Western Saharans and communities from the north of Morocco. Since 1975, important fissures have developed and this naturally created societal tensions, though at restricted levels. But it is only in the last two years that ethnic cleavages and cultural animosity have become dangerously more pronounced, threatening to fuel radicalism and more confrontations. The causes are various and profound, but most centrally they are political. The government’s preferential policies have exacerbated existing ethnic divides while its noncontingent welfare handouts have promoted a culture of entitlement that is difficult to sustain. The government has directed benefits according to people’s tribal and ethnic status as well as strict political considerations. This has heightened ethnic and tribal consciousness instead of strengthening the development of a common identity based on citizenship and democratic rights. For over three decades, the Moroccan government’s Saharan policy has failed to develop a system in which every citizen enjoys the same rights and is protected by the same laws. The Moroccan government’s Saharan policy has failed to develop a system in which every citizen enjoys the same rights and is protected by the same laws. Inhabitants who hail from northern Morocco complain bitterly that the government usually ignores their concerns, encourages them to maintain a low profile, and avoids disputes with indigenous Western Saharans. For its part, the native Sahrawi community feels that its views and interests are not represented by its elected political elites. Some have the impression that the local administration treats them with paternalistic condescension. Counterterrorism analysts and Western diplomats must be increasingly worried that organized criminal networks and other violent entrepreneurs are expanding their influence and reach into North Africa and the Sahel by exploiting regional rivalries, growing lawlessness in the camps of Tindouf, and rising ethnic tensions in the Moroccan Western Sahara. At a recent security conference in Morocco, several terrorism experts warned that insufficient cooperation between Morocco and Algeria hampers the development of a coherent and coordinated security architecture and “narrows the flows of information that are vital to disrupting an upsurge in smuggling and hostage-taking believed to be funding militants and racketeers with links to criminal syndicates in West Africa, Europe and Latin America.”8 The recent warming of relations between the two countries, however, has renewed hope that Morocco and Algeria are seriously working to alleviate their disagreements and jointly address the dangers emanating from their southern flank. No one is under any illusion that the two rivals will soon resolve their differences over the Western Sahara. Any significant inroads toward peace and reconciliation would probably have to wait for the upcoming generational shift in the Algerian military and political leadership. The aging elite are still trapped in their Cold War mentality and wedded to their original uncompromising stance over the principle of self-determination. This insistence on independence for Western Sahara has always been "an unrealistic option," to use the phrase of Peter van Walsum, the United Nations (UN) secretary-general’s personal envoy for Western Sahara (2005‒2008). Walsum correctly pointed out that Morocco will never cede its control over the territory unless the major world powers and the UN Security Council attempt to impose such a solution. This is highly unlikely to ever occur, as it would certainly destabilize the kingdom and threaten the monarchy’s own survival. The Western Sahara is probably the only issue in Morocco that enjoys near-universal and unwavering popular support. For many Moroccans, renouncing their historical right to the Western Sahara—where thousands of soldiers have died and billions of dollars have been spent defending a territory that represents almost half the size of Morocco—would be a national tragedy. This deep-rooted belief in the righteousness of their cause has unfortunately led to the negation of the legitimacy of the other point of view. It has always been unrealistic to expect the Polisario to completely renounce its competing narrative and hence its raison d’être. The movement is indeed autocratic and unrepresentative of all Sahrawis, but its aggrieved nationalism rooted in real or imagined indignities committed by Morocco still resonates in the camps. It is therefore naive and indeed counterproductive to demand that the Sahrawis in the camps accept the Moroccan self-assured historical narrative. The only possible solution is for the parties to negotiate a constitutional arrangement that focuses on the present and the future instead of the past. The only possible solution is for the parties to negotiate a constitutional arrangement that focuses on the present and the future instead of the past. Morocco’s proposal for autonomy for the Western Sahara is a good starting point. The July 2011 Moroccan constitution sets into motion a promising decentralization process, whereby effective power is devolved to elected regional councils. This process has great significance for the Western Sahara, as it has the potential to increase participatory development and government responsiveness. It will also meet one of the main demands of disgruntled Sahrawis: the ability to manage their own affairs. The new constitution provides for cultural inclusiveness as well, specifically guaranteeing Sahrawis their linguistic and cultural rights. And the new Moroccan political pact constitutionalizes the principles of individual rights (freedom of expression, freedom of association, and criminalization of torture and arbitrary detention) and equality for all citizens. The kingdom’s friends in the West, especially the United States and France, must pressure Rabat to expedite this significant devolution of power and consecrate the protection of civil liberties. In the Western Sahara, the authorities must do more to protect freedom of speech, including expressions of separatist tendencies. Suppressing opposing views does not gain Morocco the sympathy of Sahrawis. Only democracy can. One has only to look to Spain, whose democratic system has withstood the threats of strong separatist groups in Catalonia and the Basque region. The disappointment of those Sahrawis who are disenchanted with Moroccan rule does not stem from ideological convictions but from political, social, and economic deprivations. As in the rest of Morocco, the region had its share of arbitrary repression, corruption, bad governance, and rigged elections. Things have started to change under the reign of King Mohammed VI, but more needs to be done to provide the inhabitants of the Western Sahara with the dignity they deserve. The kingdom’s friends in the West, especially the United States and France, must pressure Rabat to expedite this significant devolution of power and consecrate the protection of civil liberties. Morocco has long believed that a solution to the Western Sahara conflict can only emanate from New York and Algiers. Now, there is finally a realization that the fate of the territory resides in how democratic it can become. The Polisario’s political project lacks creativity and is still controlled by the same aging generation, directed by Algeria. A real and credible autonomy will give significant prerogatives to the people and might end up convincing the refugees in the Tindouf camps that Morocco is serious in its calls for granting self-governance to the Western Sahara. 4 “Sahara occidental : divorce consommé entre le Mali et le Polisario? ” Jeune Afrique, December 27, 2011, www.jeuneafrique.com/Article/ARTJAWEB20111227114811/maroc-mali-enlevement-terrorismesahara-occidental-divorce-consomme-entre-le-mali-et-le-polisario.html. 5 Quoted in J. Peter Pham, “Not Another Failed State: Toward a Realistic Solution in the Western Sahara,” Journal of the Middle East and Africa, vol. 1, no. 1 (2010): 1‒24. 6 David Goodman and Souad Mekhennet, “Morocco Says It Foiled Terror Cell in Sahara,” New York Times, January 5, 2011, www.nytimes.com/2011/01/06/world/africa/06morocco.html. 7 François Soudan, “ La longue marche d’Ahmedou Ould Souilem,” Jeune Afrique, June 9, 2010, www.jeuneafrique.com/Articles/Dossier/ARTJAJA2577p022-030.xml1/algerie-maroc-ambassadeur-mohammed-vila-longue-marche-d-ahmedou-ould-souilem.html. 9 Javier Perez de Cuellar, Pilgrimage for Peace: A Secretary-General’s Memoirs (New York: Palgrave Macmillan, 2006), 352. I am amazed to see that in the map accompanying your article on The Western sahara tha Canary islands belong to Portugal(!!!) when as you very well know they are part of Spain. José María Robles -- thanks so much for your correction! We will definitely correct this mistake. This is a distorted report not based on facts on the ground but rather on Moroccan propaganda and the influence of its lobby in the US. I will not review this article because it will take too much time to correct the innumerable inaccuracies that pervade it. I agree with Ahmed in the comment above that this is a distorted piece or rather a propaganda piece for the Moroccan occupiers in Western Sahara. However, I would like to ask both Dr. Boukhars and Ms. Ammour, who shares the same distorted views, whether they have ever visited the camps in the Tindouf area and whether they have interviewed Sahrawis living in the camps. With respect to drug trafficking, I would like to suggest to both of them to read the latest report on the drug trafficking coming out of Morocco. During the Cold War, in order to prevent Sahrawis from exercising their legitimate right for self-determination, Sahrawis were accused of being communists. After the Cold War, they were depicted as Islamists. Now, they are traffickers and Jihadists! Unbelievable. Can the author explain how come Algeria (and most members of the UN General Assembly) supports the Sahrawis, who the two authors depict as traffickers, is at the forefront of the fight against AQIM and traffickings in the region. Dr. Boukhars should review the history of the Western Sahara conflict. He might learn that self-determination is not a concept born during the Cold War and that decolonization of Western Sahara has been inscribed in UN resolutions since the 1960s. I find it amazing that Carnegie published such a distorted article unless it has become part of the lobbies that Morocco has recruited since the inception of the conflict in the 1970s. This is too stupid because the Polisario Front which you affirm is supported by Algeria can never be the ally of AQIM, Algeria's main enemy. Responding to an expert on AQIM in Tindouf camps , A.Boukhars said on his sources and data collection : "Moroccan Intelligence" ( international workshop, Washigton DC, January, 2012). However why did he ovoid this vital and methodological question in his Carnegie paper (lack of any footnotes on data collection relating Jihadism in Tindouf, no qualitative methodology relating the camps and Jihadism, no sources on Jihadism in Algeria). Is it a propaganda paper rather than expert paper ? In this case, it a sign of the Carnegie intellectual decline. Did the author visit the camps or did he interview those how are researcher, journalistes, NGO's on this territory ? Did he do any research or is it (this piece) his opinion from Maryland, or from Rabat ? Did the author read any serious book on Jihadism in Sahel ? No footnotes. The voice of his master. La voix de son maître : the worst of the moroccan security agenda. Unfortunately, this is a biased assessment of the troubling issues in Western Sahara. The paper doesn´t cover international legal issues, TNCs' role in the plundering of natural resources of WS or the human rights violations committed by Morocco. Let me share some of my thoughts (in Spanish and English) here: http://rightsincontext.eu/category/morocco-western-sahara/ Thank you. I remeber the name of José Maria who you can find every where with her honor Barbra scrumbling to defamate any thing that makes people cognitive process works vis á vis the issue of Moroccan Sahara. Ecxept that Mr Jose this time was more concern to remind the editor that the Cannary Islands belongs to Spanish but not to Portugal. Her Honor Barbara she is a pretender, who claims that this article is not well grounded to be accepted as a scientific research only the author has even handedly analysed the parties involved in this imposed conflict. Let me remind her that she Has praised what is to my opinion a one sided article in FPIF as a well researched scientific endeavor,in so far as Morocco was the target of the writer. Mr Ahmed is the Algerian lobby in the Congress is loosing ground to the Moroccan How sad!!!! Melilla, ceuta and the sahara are morocan territories.